Cecil Rajendra once commented on Lee Kian Seng’s ‘Of ' Image, Object, Illusion ' – Off Series Mechanism’: “…It is loaded with symbolism that teases and invites the viewer to interpretations. Why is the flag reversed? What does the cockroach on the top right of the painting mean? Does it augur ill for our future? 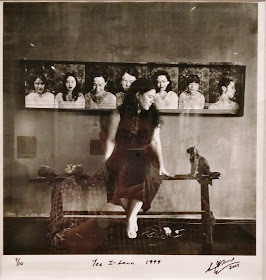 It is also a beautifully composed picture that achieves an almost perfect balance between subject matter and media..." While the artist’s displeasure with Balai for exhibiting his works wrongly is well known, it is perplexing how they got it wrong again, including the artwork title on the wall placard. One student noticed that the lighting is wrong (my observation: is the real flag hung too low? ), as there is no shadow reflected onto the floor. If the presentation of art is the responsibility of the curators, then this one is also on them. 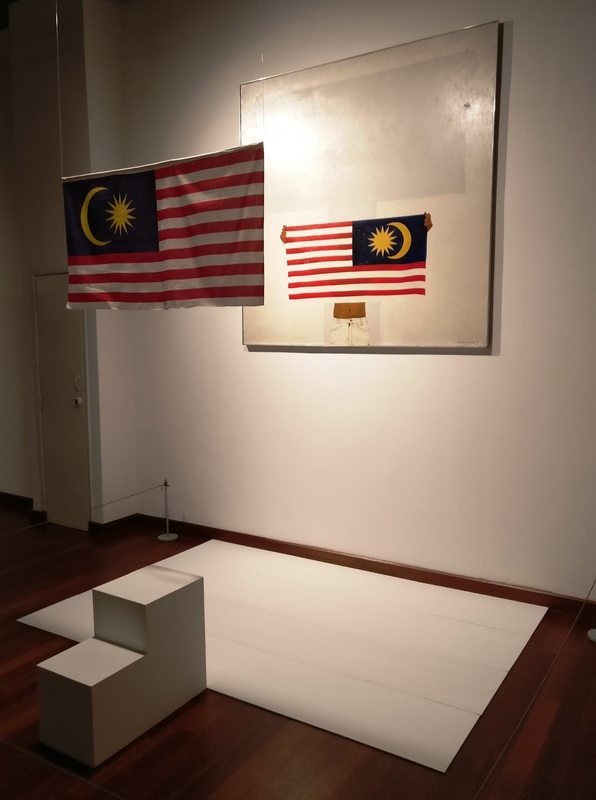 With 5 curators working within 5 broad themes, one can look past incoherent curatorship, especially when the “Negaraku” exhibition is part of a larger patriotism project. Apart from works that feature political slogans, most exhibits present little correlation to the idea of nation-states, which is a good thing. For the casual visitor, visiting the exhibition is a pleasant affair, apart from the occasional irritation felt when reading wall placards. The decision to state the age of the artist on a separate placard is odd, notwithstanding theoretical debates on when an artwork is completed. Translation is the real bugbear, as the task to render all titles into Bahasa Melayu, looked like it was done by an intern and reviewed by no one. Typos and illegible texts abound. If the presentation of art is the responsibility of the curators, then this one’s on them. Wall text for a 1971 painting by Ibrahim Hussein – title is ‘Unknown’? Mesonit bod? Bahasa or English to name the collection it came from? Why not reveal that this is a restored mural from the sports center of Universiti Malaya? Even before entering the exhibition gallery, “Negaraku” makes a loud statement via the hanging of Zhang Zhou’s ‘Keranamu Malaysia’ (who?) at the lobby, flanked by a mixed media painting by Ahmad Shukri Mohamed with people & place names emblazoned across it, and two installations by Zulkifli Yusoff. The latter is a visual translation of the agricultural diversity program Rancangan Buku Hijau, launched by Tun Abdul Razak in 1974. With its layered canvas strips, resin-encased protrusions, and wall-height display, Zulkifli’s work seems to encompass all five of the exhibition’s curatorial themes: Landscape, Social Interaction, Beliefs, Abstract and Inheritance/ Independence. For all its virtuosity, there is only one reason why it is presented in Balai’s lobby – as a talking point when the current Prime Minister (and namesake reference) opened the “Negaraku” exhibition on 16th June. My country, indeed. Notes at SFMOMA: Fun exit by getting lost in a Richard Serra construct, although a so-so permanent hang offers little surprise. One gallery dedicated to Alexander Calder presents a great range beyond the well-known mobiles, and provides visual evidence that “the exceptional quality of his sculpture was often the result of its unique combination of precision and chance.” Also poignant was a room full of Warhols, where one is surrounded by re-printed portraits of dead celebrities, as if visual immortality is preserved in an unnatural and ironic (‘Pop’) state. I learned about Martin Puryear from John Yau’s reviews of the artist, and it was a pleasure to finally see the fully-formed artworks. 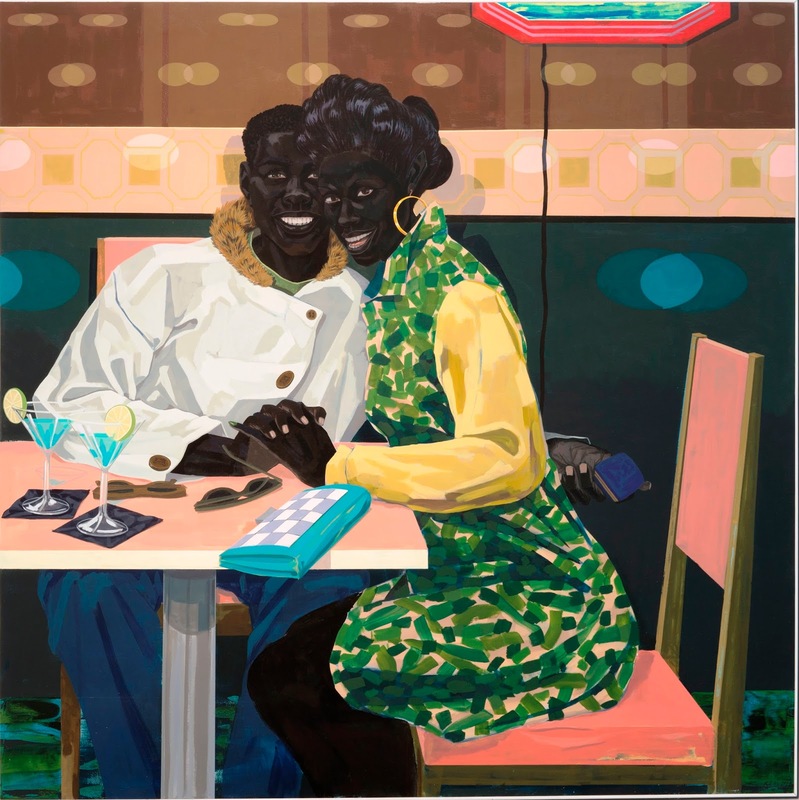 Kerry James Marshall retrospective at MOCA: Commenting upon “the presence and absence of blackness”, “Mastry” presents important works by one well-known American contemporary painter. From early self-portraits that emphasize blackness, to crowded and symbolic compositions, to his mature style of figures populating lively scenes, Kerry James’ major series of paintings are shown alongside smaller projects and photographic installations. ‘De Style’ and ‘School of Beauty and Culture’ are wonderful examples that amalgamate daily life with visual tropes, while the powerful triptych ‘Heirlooms and Accessories’ transforms the image of a lynching event into a symbolic burden. Browsing this superb collection of well-executed paintings, pictures like ‘Black Painting’ hangs heavily in one’s mind, although I did leave with a broad smile taken after the ‘Club Couple’. 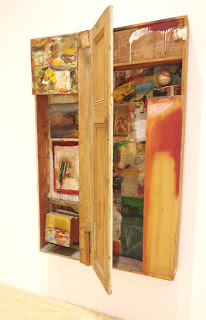 Notes at MOCA: Walking past one large & tiresome installation by Thomas Hirschhorn, then humoured by Rachel Lachowicz’s ‘Lipstick Cube’, I stopped transfixed in front of Robert Rauschenberg’s ‘Interview’. One of the artist’s earliest combines, the collection of paint and images demarcated by a swinging door, projects into the viewer’s space yet draws one closer to the work. What unknown/anxiety is Bob alluding to? Is art-making, art-presentation, art-know-how, or art-selection, what people want to know about the artist? Are sports and food the best conversation starters in New York City? Does staying in one’s closet offer help advance a relationship? ‘Interview’ is not a product of introspection, but a reaction towards social interactions. Painting and found objects, what a great combination. Chicago Public Art: Braving the cold (stupidity), I spent a morning tracking down as many public art sculptures I could locate that were close to the Loop, by referencing the city’s official Public Art Guide. The list of famous last names is long – Calder, Picasso, Dubuffet, LeWitt, Serra, Wool, Castle, Oldenburg, Plensa... yet crowds gather only at Kapoor’s ‘Cloud Gate’ for a photo stop. Less Instagram-friendly but more engaging than a shiny bean, is the sounding sculpture by Harry Bertoia, located at the plaza of Aon Centre. Copper rods fixed onto a brass base sway in the Windy City breeze, its musical chimes offering an enchanting experience to complement the view of Lake Michigan (or skyscraper) in the background. Viviane Sassen at MoCP: “Conceived as an installation work with seven different chapters”, “UMBRA” by the Amsterdam-based fashion photographer remains the best solo exhibition I seen this year. 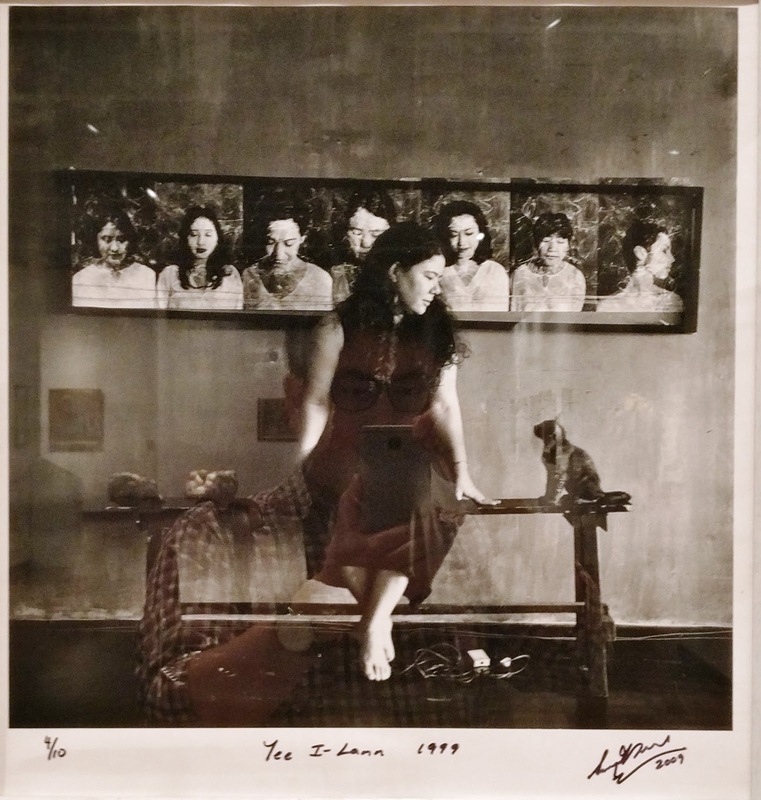 The size and themes of pictures exhibited in each section is distinct, yet the play on shadows and mirror images infuse a psychological dimension into her captures. Moving from a meditation about burying the dead and coloured shadows upstairs, to the lucid snapshots of people that juxtapose sunlight with darkness, Viviane’s works display a knack for surprising visual configurations within a rectangular freeze frame. I sit in the dark room and watch the sign language performance video ‘Hurtling’ three times, before settling into the LARVAE installation to trace surreal close-ups of human bodies. Mirrored projections are nonidentical; shadows take its desired form; reflected light rays hurtle. Art AIDS America Chicago at Alphawood Gallery: As described by one reviewer, this staggering “show explicates how the art created during and after the AIDS crisis is not a footnote or a sub-genre in art history, but something that impacted the course of it.” This temporary gallery space is charged with personal emotion relayed through the many artworks, that successfully engages visitors with anguished tributes, coping mechanisms, and a collective voice. To cherry-pick one artwork feels like relegating the rest, as I become a bit more optimistic about art as a politically mobilising force. In this day & age when people feel uncomfortable after watching Moonlight, it is still relevant to anchor an exhibition onto a traumatic duration, especially when there is still no cure for AIDS available now. Visitors ascending the spiral walkway to the third-floor galleries are in for a treat. 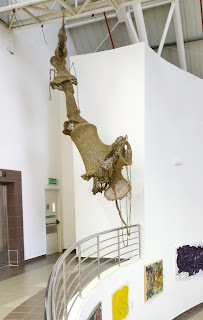 Walking past well-executed paintings – some surreal figurations, some abstract expressions – one is greeted by a large marionette made from jute ropes. Lisa Foo’s aptly-titled ‘Being in the Moment’ grants playful freedom; Otherwise one can slingshot chalk onto a classroom blackboard, duck and run through a geometric-shaped passage, sit on beautifully-designed rubber wood bar stools, lie down inside a bulbous plastic bag (with a fan blowing inside), or engage in a game of Chinese chess with trapezoidal constructs as moving pieces. Within the smaller gallery hangs a floral wreath made from plastic bottles, while a comic strip about Kapitan Yap Ah Loy is encased in an acrylic box nearby, and a collection of repurposed biscuit tin cans and small framed drawings is arranged in one corner of the gallery. I appreciate Anna Azzreena’s quirky observations about sitting poses. I laugh out loud at ‘My Language Proficiency’ by Okui Lala, a video of the artist having a conversation with her selves in English, Mandarin, Bahasa, and Hokkien. I indulge in the spectral yet lively figures in Hamidah Abdul Rahman’s ‘Kitaran’. I marvel at clay ‘Globe’(s) by Ham Rabeah Kamarun, its caked and hardened surfaces reinforcing its status as tactile art objects. I watch stoically at Sharon Chin throwing flowers forcefully onto the tarmac in the recorded performance ‘Ria/Joy’. I was struck in awe by Mah Chai Soon’s ‘Labourers’, a sketchy watercolour painting made in 1966, and collected by Balai the following year. 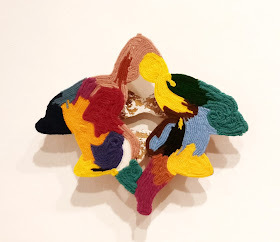 Even after admiring crafty and colourful textile works by Ani Emina Azman and Yim Yen Sum, there remains no obvious hint that I am looking at artworks done exclusively by women artists. Only after coming across the word Anxiety on a wall near the larger gallery’s entrance, did I pay attention to the "women artists only" aspect of this exhibition. Several questions spring immediately to mind regarding the exhibition theme. For one, specifying a gender reinforces clichés associated to “women’s struggles”, i.e. women artists receiving less recognition, woman as child-bearer and primary care-giver, feminist beliefs that challenge social norms, etc. Secondly, the exhibits are culled from multiple sources – the national collection, works chosen by artists already represented in the national collection, artists invited by the curator, and an open call (which includes five students). This haphazard selection resulted in 101 women’s artists, which number is retained in the exhibition title to imply an introduction or primer. Given that its exhibits are sourced from various channels, and only one curator involved, it is unfair to expect a coherent show. The result is a sprawling presentation with some complementing works shown together, some sections that reinforce clichés, some works which seem better suited for another exhibition within the same building, and some rarely seen gems from the national collection. As indicated by statistics presented outside the gallery, institutional recognition is the key theme. For the 2006 exhibition “Holding Up Half the Sky by Women Artists”, a survey done only with pieces from the national collection, curator Laura Fan stated that, “(e)ven with the collection, there may be several women artists who have been overlooked either because their names were not recognized…” This is true as my favourite Malaysian female contemporary artist was not included among this 101. 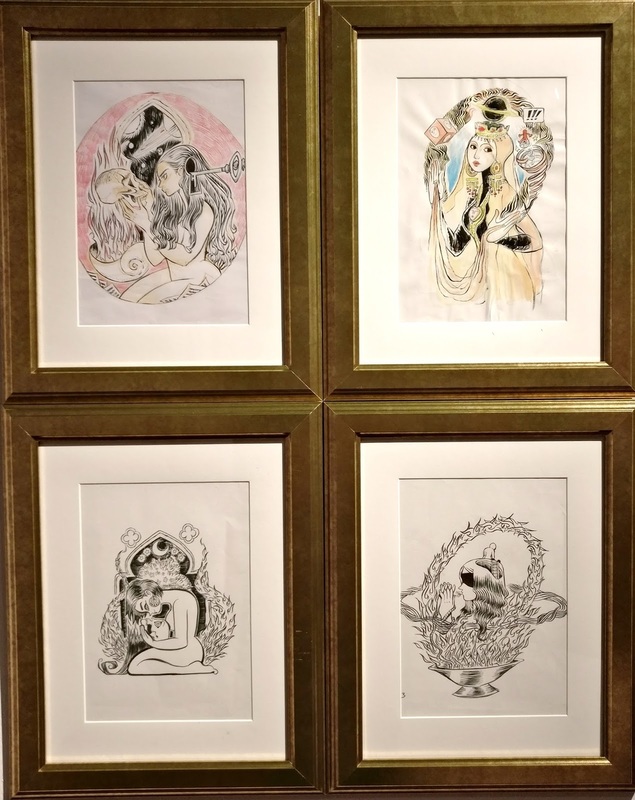 Putting aside the definition of “women’s struggles”, many works project a keen sensitivity that is less apparent in works by local male artists. 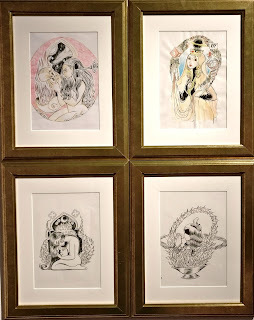 There are images that reinforce the artist’s gender, such as Yee I-Lann’s portrayal of seven women in the arts, or the four beautiful Celtic-inspired illustrations by Sarah Joan Mokhtar. 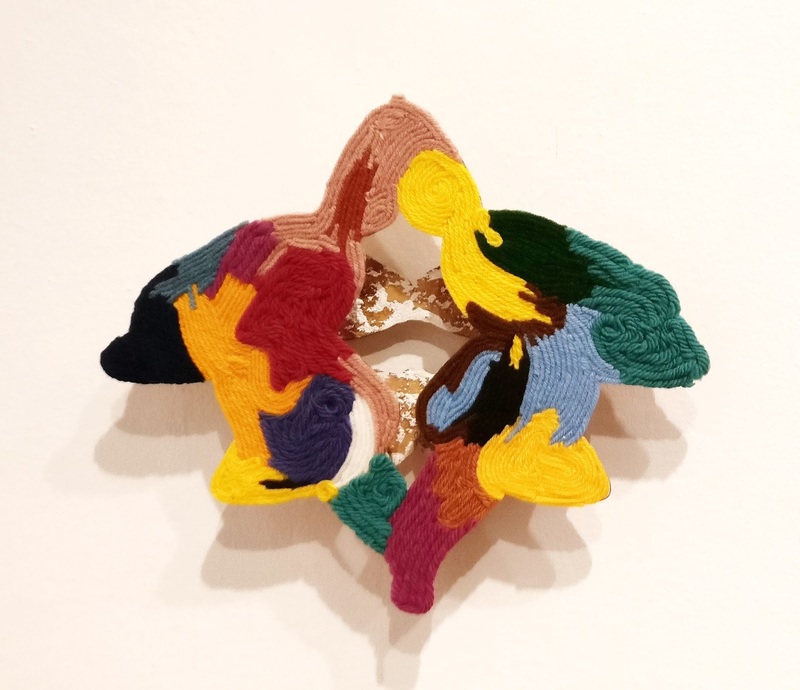 There are masterful usage of materials, such as Jasmine Kok’s fantastical ceramic and velvet wall sculpture, or the small gesso and wool ‘Object 006’ by Naomi Ching. There is a pair of dense, personal, and brilliant paintings hung side by side, by Eng Hwee Chu and Anna Chin. Special regard is accorded to the video record of Intan Rafiza’s 2012 performance at Chow Kit, and Ruby Subramaniam’s photo series of dancers in body paint posing in Brickfields. These two works approach the theme of body politics with aplomb, and should be celebrated for making its way into the National Gallery. Which leads me to the most interesting exhibits here – pieces from the national collection, especially those acquired in the first 30 years since its inception. I wonder about the life and times of Katherine Sim, whose portrait of ‘Salmah’ is dated 1948 and was collected in 1959. Liu Siat Moi’s casual ‘Self Portrait’ is hung on the same wall as a 1968 painting by Nora Abdullah, the latter an accomplished comic artist whose 1956 illustrated book was acquired by the British Library. The most stunning work belongs to Rokiah Yusoff, whose ‘Pasangan Melayu’ is a collage consisting of painted cut-outs, rattan placemats, lace, and magazine snippets. With its printed words, awkward figures, and crafty patterns, the work recalls a combination of Richard Hamilton and Ismail Zain, while offering a fresh take of a local subject matter. Google has not yielded a single piece of information about Rokiah Yusoff, the artist. Institutional recognition remains a pressing question, when one wonders why a work as significant in Malaysian art history as Nirmala Dutt Shanmughalingam’s ‘Statement 1’ – a breakthrough in social commentary art – is not included in the “Negaraku” survey downstairs. In another article, I read about Sivam Selvaratnam remarking about the importance of institutional acquisitions during the 1960s & 70s, especially for works by women artists which were less popular with private collectors. 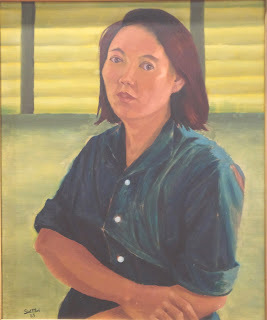 While there is not sufficient information here to trace a lineage of women’s artworks in Malaysian art history, the wide-ranging works in this exhibition demonstrate that the fe/male binary is less apparent than what one first expects, and that can only be a good thing. It is a real-life translation of the wonderful “MyWomen’sArt” Twitter account, and a celebration of good, diverse art. The sequence of events that culminated in this exhibition is well worth recounting. 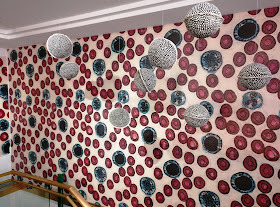 As stated in the catalogue, it started with Juhari Said inviting Anees Maani to his studio Akaldiulu in 2010. In 2014, Anees joined Mamoru Abe for another residency at Akaldiulu, then Juhari visited Anees’ studio in Amman the following year. Upon returning to Malaysia, Juhari and Setiawan Sabana arranged for the inaugural Barehands – Asian Artist Residency Project to be held in Bandung, with 19 participants from five countries. The rotation continued with Mamoru hosting 21 artists in Fukuoka, who stayed in Munakata for a week. For this Kuala Lumpur leg, 28 participants spent a month beginning April 2017, in five studios spread across town – Akaldiulu, Pantau Iraga (Awang Damit Ahmad), Studio Tikus (Samsudin Wahab), M.I.A. Studio, and RAG Studio (Ramlan Abdullah). While residency programs offer great learning and networking opportunities among fellow artists, the short duration and expectation to produce exhibits, is typically seen as a constraint towards good art-making. However, Barehands boasts an international line-up of mid-career artists, and experience shines through in this collection of well-executed artworks. In works exhibited immediately outside Galeri 2A, Kenji Makizono offers clever takes on Malaysian matters. ‘Look Yeast’ presents a metaphorical play on Mahathir’s “Look East” policy, with local ingredients such as tapai and tempoyak left to ferment in vitrines. On the wall, 30 horizontal photographs of water tanks captured in and around Kuala Lumpur, is titled ‘The City and Its Tower’. A couple of these snapshots even feature the Petronas Twin Towers and KL Tower. Entering the gallery, one is struck by the smell of earth, the sound of waves, and the many artworks made from natural or industrial materials. Among creations by foreign artists, it is difficult to pinpoint specific Malaysian influences, notwithstanding the works’ visual attraction. Paintings of tropical plants and embedded signboards. Rusted metal plates fused together into a rectangular picture. Woodcut prints of large faces onto tufted cloths. Creatures illustrated manga-style onto banners by Indonesian artists. Multiple layers of coloured stripes. A video focused upon bare hands. 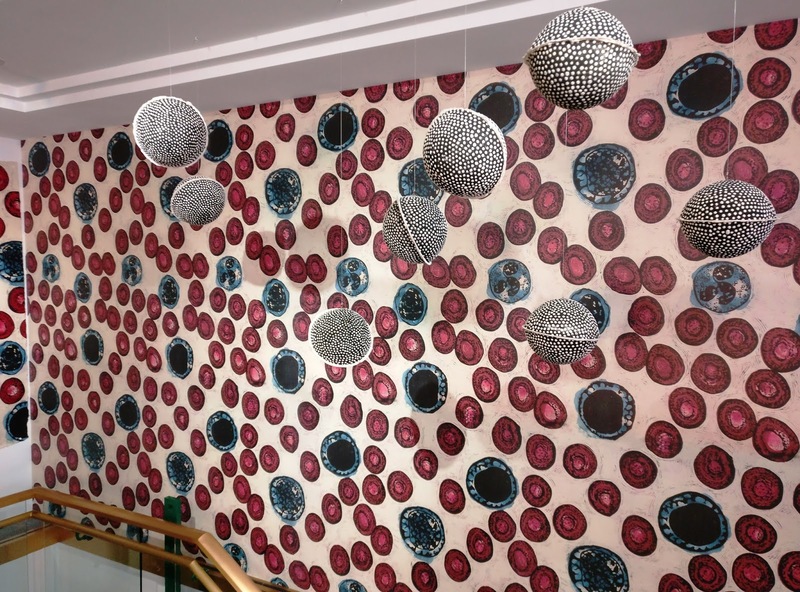 Interactive art which requires visitors to stare at a dot, or make clay objects. The sparse exhibition layout only accentuates the lacking coherence between artworks. Nevertheless, it is nit-picking to expect more from an end-of-residency show. I probably appreciate the works by local artists better, because I am familiar with their oeuvre. Marvin Chan’s ‘Desecration of the Temple’ assembles drapes and paintings onto a red wall, where women figures appear ready to smash the ceiling over a church’s nave, as a hardened heart is depicted at the centre. In ‘Lee Kuan Yew & The Tales From The Little Red Dot’, Stephen Menon juxtaposes the Singaporean’s portrait with various symbols, which result in a cheeky yet ironic series. Outside, two large & three small paintings by Awang Damit depict forceful expressions, and one imagines that Tisna Sanjaya’s powerful painting displays traces of influence from the senior artist. Ramlan Abdullah’s ‘Zero to Zero’ recalls the term kosong-kosong this Ramadan month, and its sturdy construction projects an elegant aesthetic balance. Equally crafty are creations by Sharmiza Abu Hassan and Bibi Chew. The former’s conjoined bird cages and floating nest with roots, explores sources of inspiration; Coconut husks and sawdust from the latter, denote symbolic representations utilizing heavily-textured materials. Faizal Suhif’s ubi-shaped print appears static in the presence of Samsudin’s ‘Mud Tent’, literally a tent-shaped cloth covered in mud from Tanjung Harapan, Klang. An accompanying video captures the work/performance by Buden, as the artist digs up wet grey soil and spreads it across a long piece of white cloth. What is left behind – a muddy shelter, a hopeful hovel, or both? Although it is unclear how the name Barehands came about, a conjecture can be made based on exhibited works by the project initiators. Quirky-shaped sculptures on pedestals, lead up to two rust-coloured figures by Juhari. Anees’ smooth pieces of wood draw attention to the medium’s distinct grain and texture, which presents a balancing effect when contrasted with the generic wooden veneer of gallery floorboards. The transformation of materials into appealing forms continue with Mamoru, whose ‘Surveyed Map’ recalls a dried-up diorama of a sunken lost city, while Setiawan’s ‘Paperium, Reflection’ makes industrial detritus from paper and wood. Being hands-on from crafting one’s artwork, to building networks, to organizing exhibitions, require a significant amount of effort and resilience. The sensual experience of this show, testifies to all that.